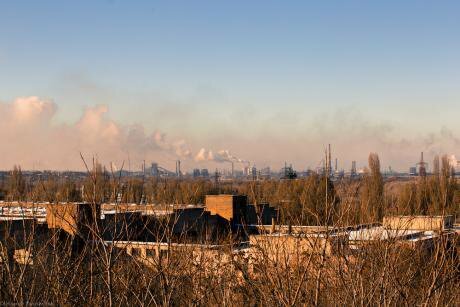 The former Dnipro Chemical Plant, with Kamianske in the distance. Photo courtesy of the author. All rights reserved. Borys Petelin, a former worker at the now-closed Dnipro Chemical Plant in Kamianske, believes that the roughly 40 million tonnes of radioactive waste stored here pose a significant danger not only for the city, but also for the Dnipro river that runs through it. 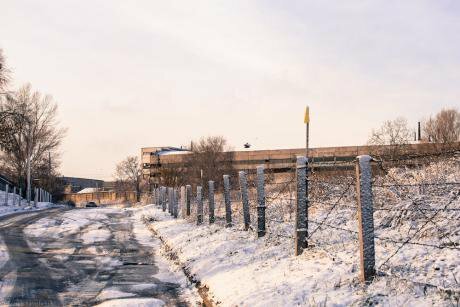 Located to the south of the 240,000-strong city, this plant was one of the biggest uranium ore processing sites in the Soviet Union’s nuclear industry. Coming up to the plant, Petelin guides me to an area surrounded by barbed wire. There’s small signs dotted about here, warning those who approach of radiation: the former chemical plant is home to nine tailings dumps that store radioactive waste. My guide suggests that some of the oldest dumps may not be separated from the soil at all, potentially polluting the local water as a result. Recent research confirms that radionuclides have leaked into the soil and water, and that they are a source of radioactive dust. Official state documents also confirm this. Over the past ten years, work by Ukrainian researchers has shown that these landfills are in bad shape. But while the European Commission has launched a technical assistance project to isolate the most dangerous sites and assist with monitoring, the Ukrainian authorities seem reluctant to change the situation. After the Second World War, the Soviet Union was looking for uranium necessary to produce its first nuclear bombs. The city of Kamianske (Dniprodzerzhynsk at the time) was selected as a site for a new secret plant, which was designed to enrich uranium and prepare yellowcake, the uranium concentrate powder that is an intermediate product of processing uranium ore.
From 1947 to 1972, Factory No. 906 was the biggest producer of yellowcake in the Soviet Union. In its heyday, the factory reprocessed 65% of all uranium ore recycled inside the USSR. At the outskirts of the Dnipro Chemical Plant; people's homes are located some 200-300 m from radioactive territory. Signs warn about radioactive threat. Photo courtesy of the author. All rights reserved. In 1999, the territory of the plant was divided into several parts. A new state enterprise, GP Barrier, was created under the supervision of Ukraine’s Ministry of Energy and Coal Industry to carry out oversight and control of the contaminated sites and buildings. Other territories were handed over to state and private chemical companies. As a legal entity, Dnipro Chemical Plant was liquidated in 2007. The plant was declared bankrupt and its property exhibited for auction. Waste, called pulp, is now stored in nine open-air dumping sites, or tailings: West, Central Gully, South-Eastern, Dniprovske (“D”), Sukhachivka (sections 1 and 2), Base “C”, Lanthanum fraction, and #6. Some radioactive waste, together with poisonous chemicals, was poured directly into these sites, former clay mines. Overall, they contain almost 40 million tonnes of powder-like radioactive waste. To compare, Chernobyl Reactor No. 4 contains considerably less waste, 2.5 million tonnes. At Chernobyl, the total activity of radionuclides, which produce ionising radiation, is less than two thirds of radioactive activity found at all the tailing sites at the Dnipro Chemical Plant combined. This forms a permanent source of radioactive contamination on the plant’s territory, the city of Kamianske, and also to ground and open water sources. 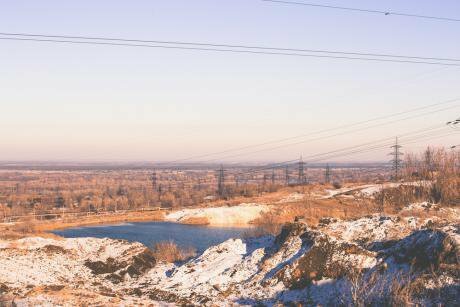 In 2015, researchers at the Ukrainian Research Institute of Environmental Problems found that those tailings emit both dust and radon, a radioactive, odourless and tasteless gas. Approximately 250,000 square metres of territory around the plant are contaminated with radionuclides. The railway network stretching from the Zhovti Vody uranium mine to Kamianske’s local system is also contaminated with radioactive elements: uranium ore was usually transported by rail in open carriages. Local journalist Valentyn Figol believes that the drying out of these tailings poses the most significant risk. “Some of the tailings were covered by water. It prevented the pulp from drying out. But today the tailings are starting to dry out,” Figol said in an interview in Kamianske, referring to the possibility that the resulting dust could be transported by wind. At the entrance to the administrative office of GP Barrier. Photo courtesy of the author. All rights reserved. Ihor Khlivnyi, director of GP Barrier, believes the situation at the former plant is not critical. He explains that at Sukhachivka, one of the tailings sites, waste was not dumped directly onto the land. On the contrary, the site was prepared: the ground was covered by a few layers of sand and an artificial cover that protects soil and water. Since solar rays destroy the artificial protective cover, water should cover the tailing. After the plant was closed in the 1990s, the water-supply system that channeled water to the tailing sites fell into disrepair. Yuri Korovin, a former director of the plant, recalled that 16km of pipes have been stolen. The Sukhachivka tailing is also covered with a layer of phosphogypsum, according to Khlivnyi. This fertiliser byproduct, which is produced by a nearby chemical plant, is regularly used to cover the tailing site as part of an agreement between the two companies. “This is how we substitute for water,” Khlivnyi explains. Radioactive materials are also present inside the buildings where yellowcake was produced. In a 2016 interview, Oleh Voytsekhovych, an expert from the Ukrainian Hydrometeorological Institute, explained that there are 20 contaminated buildings on the territory of the plant. In 2003, Ukraine’s Cabinet of Ministers adopted an 11-year programme to make the territory of the former Dnipro Chemical Plant ecologically safe, and to protect local residents from the harmful effects of ionising radiation. This plan was followed with another programme in 2009, which is still running today, at least at the legislative level. But many have questioned this programme’s efficiency. For instance, Viktor Ryazantsev, head of the safety unity at Ukraine’s State Nuclear Inspection, says the actions taken were chaotic and the Ministry of Energy did not monitor GP Barrier properly. The Ukrainian government has spent millions of hryvnias on various projects — between 2010 and 2014, 84 million hryvnia (at that time $10.5 million) alone. Despite this, the reality at the plant has not changed significantly. But radioactive waste is not the only problem here. What’s more important is the historic reluctance of officials at both the national and local level, as well as the former directors of GP Barrier, to implement the state programme. No one, it seems, wants to take responsibility for the lack of progress. By contrast, city council member Andriy Ivanchenko believes that both local and state authorities are responsible for the situation. “The Department of Environment [in Kamianske] has to inform the national authorities, write petitions, cooperate with MPs. It should be on the list of priorities for the state authorities,” he explains. In August 2018, in an interview with Kamianske newspaper Clever City, Bohdan Napolov stated that he had expected the GP Barrier would receive funding before the end of 2018, but Ukraine’s Ministry of Finance and Ministry of Economic Development refused, referring to a 2016 Cabinet of Ministers decree that prohibits the introduction of new state programmes. The 2003 state programme confirms that certain substances, such as uranium, radium, thorium, polonium and lead, have leaked into the Konoplyanka river, located between the tailings, and next to Dnipro river. The city center of Kamianske. Photo courtesy of the author. All rights reserved. Eventually, in October, Ukraine’s Ministry of Energy created a special urgent commission to find a solution to the problem. When I visited in November 2018, Khlivnyi assured me that there is a government decision to allocate 14.9 million hryvnia (£409,000) to the plant in 2019. But still, it is not enough to repay GP Barrier’s debts, which have reached 20 million hryvnia (£549,000). However, in January, Khlivnyi commented that GP Barrier may not receive these costs at all, rather they will be used to pay land and other taxes. There is a great possibility, he says, that GP Barrier will soon be liquidated as an enterprise. 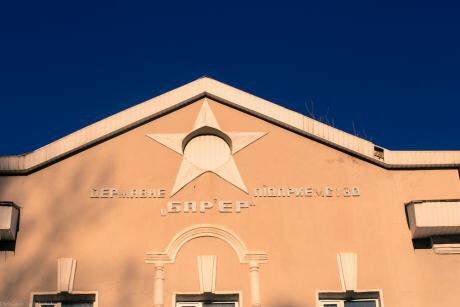 During the last audit conducted in 2016-2017 (a copy of which openDemocracy holds), the Ministry of Energy found that the GP Barrier misapplied 3.7 million hryvnia (£107,000) on salaries and procurement. The auditors discovered that the company allowed the clearing of more than 200 cubic metres of trees from a tailing dump, and sold 300 metres of radioactive pipes. A local police department opened a criminal case, but they did not establish who bought this possibly highly radioactive wood. In total, auditors found 13 violations between 2015 and 2017. Auditors’ conclusions were unsatisfactory. In 2016, the State Audit Service of Ukraine made similar conclusions. Second, even though central state funds were allocated, former directors, Khlivnyi says, used them improperly. “Barrier concluded agreements with organisations that did not fulfill their obligations at all or fulfilled them improperly,” he told me. “The money disappeared, the works were not carried out, and programmes were completed without the smallest success.” Oleh Voytsekhovych, an expert from the Ukrainian Hydrometeorological Institute, has raised similar concerns. During parliamentary hearings held in October 2018, the Ukrainian Ministry of Energy stated that only 48.6% of the costs from the approved amount of budget funds were allocated to Barrier during 2015-2017. Out of 24 action points, only four were implemented, six were implemented partially, and 14 were not implemented at all. Between 2014-2016, Ukraine received 10 million EUR of technical support from the EU’s Directorate General for International Cooperation and Development. The money was spent on developing a strategy for decontaminating and rehabilitating the former Dnipro Chemical Plant site. In 2018, the programme was renewed, but due to the lack of state funding and Barrier’s huge debts, the EU had to suspend it. In 2019, the programme will be renewed only if the government reaches a conclusion whether to continue financing GP Barrier. One of the tailings dumps near the plant. Photo courtesy of the author. All rights reserved. When the cleaning programme is finished, it is anticipated that the contaminated buildings will be isolated, and the contaminated sites will be under strict control. In theory, the territory should be safer for both workers and Kamianske residents. Today, Barrier is chronically underfinanced. But, according to Khlivnyi, it can be profitable. “In Sukhachivka we can accept solid and liquid waste for storage. Former directors tried to initiate these kind of projects, but they were not successful,” he explains. But even the promise of fresh financing cannot solve the problem completely. 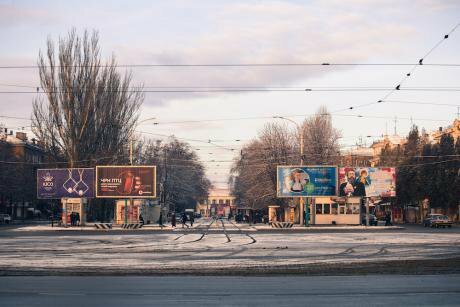 Everyone, from state officials in Kyiv to local authorities in Kamianske, appears to acknowledge the issue, but only extreme conditions – such as the risk of losing funds –prompts them to find quick and effective solutions. Given that the EU programme will soon finish, what awaits Kamianske: another stalemate or real positive changes?